This is a rectangular Plume Motor Spirit porcelain sign. This particular Plume Motor Spirit sign is white with blue text. 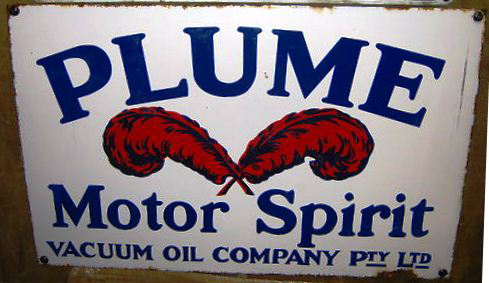 It reads, “Plume Motor Spirit, Vacuum Oil Company Pty Ltd” and features two red plume feathers in the center.